Otto Freundlich is a representative of the School of Paris. He was born in Slupsk, Poland, in 1878, and died in Majdanek Concentration Camp in 1943. Before 1907 Freundlich studied the theory of music in Munich and the history of art in Florence. In 1907 he began to study sculpture in Berlin under the tutorship of Arthur Funcke. In 1908 Freundlich settled in Montparnasse, Paris, where he got to know Picasso, Braque and Apollinaire. It was at this time that he developed his artistic style. 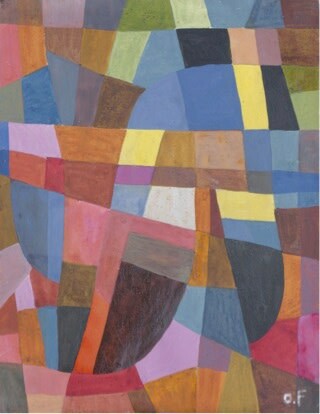 Cubist and abstract motifs are the dominant features of his early paintings and drawings. His passion for cubism and the primitive art forms of Africa and America can be clearly seen in his well-known work, “New Man”, which he created in 1912. After this Freundlich regularly took part in various exhibitions not only in Paris but also in Berlin and Munich. His creativity was not limited to painting, and he also tried his hand at stained-glass, tapestry and mosaics. In the 1920’s and 1930s he worked in publishing (on the journal, “Angelus Novus”) and helped organise the International Exhibition of Revolutionary Artists in Berlin. He also wrote some theoretical theses, “Paths of Abstract Art” (1934). In 1930 Freundlich married Jeanne Kosnick-Kloss, who was also a sculptor and painter. His well-known monumental sculptures, “Ascension” and “Composition” (1933) were created at this time. Today a bronze version of “Composition” can be found in the Tuileries Garden in Paris. In 1936 Freundlich initiated his “Roads of peace” project. The plan was that two roads of sculptures would pass through many European cities and intersect in Auvers-sur-Oise at the place where Van Gogh was buried. When the Nazis came to power Freundlich was forced to go into hiding. A picture of his sculpture, “New Man”, was used as the cover illustration for the catalogue of the notorious 1937 “Degenerate Art” exhibition. This exhibition became a kind of pinnacle of the dark, totalitarian ideology of Nazism. “New Man” is assumed to have been destroyed by the Nazis. In 1943 Freundlich was denounced and arrested in the Pyrenees, where he was hiding from the Nazis. He was sent via Paris to the Sobibor Concentration Camp, where he and thousands of other European prisoners were executed there. Freundlich has left a legacy of abstract paintings and monumental sculptures. He used a variety of materials and techniques: in his paintings - gouache, tempera and oils, and in his drawings - lithography, wood engraving and ink. Interest in his work is as strong as ever, and a solo exhibition was held in Pontoise, France, in 2009. Monographs on his work have been published in France and Germany. His abstract compositions are saturated with dynamic colours in multiple shapes.